Sometimes — as happened recently with Cumulative Update KB4469342 — Windows Update won’t offer an update file to specific PCs. They may be blocked from receiving the update for technical reasons such as driver incompatibilties, or Microsoft may simply be staggering release of some updates over time. In such cases, if you have an urgent need to install the update, or if (like me) you routinely apply them to test machines for analysis and review, you can often grab such updates from the Microsoft Catalog. Note: this does not apply to Windows Insider Release Preview updates, whose release mechanisms normally proceed through the Windows Update service, and which may not make it into the catalog at all. In such cases, update downloads in the form of a .CAB (cabinet, a type of file archive that compresses and packages whole collections of files into a single umbrella file) may become available through other channels or sources. For me with the .168 point release for Windows 10 1809 Release Preview, it came in a set of links in a TenForums post about this Cumulative Update (see Post #21 and Post #31 for examples). CAB is a file extension for Microsoft Windows systems. The CAB file is a compressed archive which supports DEFLATE , Quantum, and LZX compression. CAB files are used by windows installation engines such as Setup API, device installer and advpack. CAB files typically contain drivers, system files and other Windows components. The installation engine extracts these files for use in the set up of various software and hardware. Windows Updates sometimes come in the form of cabinet files. When they do, you need a tool with which to install them because they don’t work like executable (.exe) files or even like Microsoft’s own self-installing file formats (such as .MSI and .MSU). Though you can find third-party tools to install CAB files, there’s no need to do this. DISM is perfectly able to handle such files with dispatch and aplomb. Read on for the details. DISM /Add-Package Does the Trick! 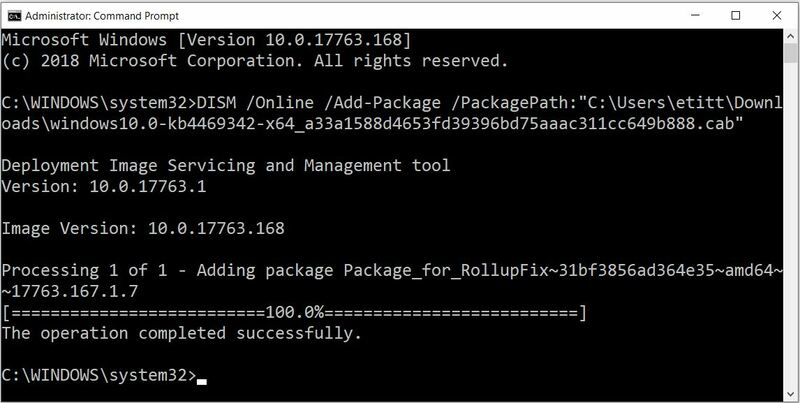 The DISM /Add-Package command works with CAB files to add (or remove) packages from a targeted Windows image. CAB files may be used to accommodate updates, language packs, and Windows features and functions. To run DISM in general and to work with packages in particular, you must be logged in with administrative privileges. You can run DISM in either a Command Prompt (Administrator) window, or in a PowerShell (Admin) session. The syntax is easy and straightforward (unlike certain other DISM commands, especially when providing an alternate source for Windows files using the /Source parameter). I assume you’ve downloaded your CAB file and can navigate to where it lives. In File Explorer, if you hold down the Shift key and right-click the filename, you’ll see “Copy as path” show up in the resulting pop-up menu. If you do this with the CAB file with the update you wish to install, it will copy its complete path specification to the paste buffer for you. DISM /Online /Add-Package /PackagePath:"<full file specification, including path>"
When you get to the path specification part, you can click CTRL-V to paste the contents of the path that you grabbed with the right-click maneuver. If you do that, it inserts it for you (including the opening and closing double quote characters necessary to enclose it). Hit Enter thereafter, and the command will run. If things work properly, DISM will nearly always ask you if you want to restart the PC where the update was applied. If you elect not to do that immediately, do it as soon as you can. Until the machine restarts, the update won’t be fully and properly applied. That’s all there is to it. Pretty simple, huh? DISM also supports additional options for package and features access, addition, information and removal. See this great Microsoft article from the Hardware Dev Center for more details: DISM Operating System Package (.cab or .msu) Servicing Command-Line Options. It will set you straight. Enjoy!